I know I already said it…but I heart this quilt. I wish you could see it in real life because pictures just don’t do it justice. 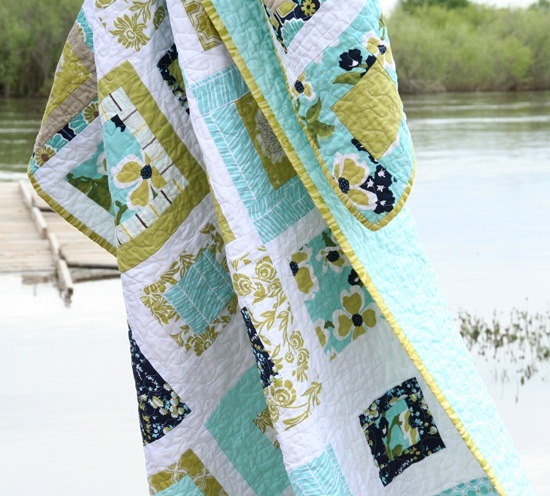 This quilt is going to be perched in my living room for a long time….or at least until I make a new favorite….hmmmm. Wow! That is beautiful. Thanks for the tip on the Ikea sheet – gotta check that out. Beautiful quilt! Thanks for the idea to get a sheet from Target. Less expensive than buying fabric by the yard. Lovely quilt. Thanks for the "hot tip" about the backing! I have a stack of Amy Butler fabric just waiting for the inspiration to hit. I think this is it! How big are your blocks??? I look at Goodwill stores too for sheets to use as quilt backs. They are $2.00 at our local Goodwill store. Could I ever bug you to share the color of the green and tan solids you used… I would like to do a shower curtain for my BR and need something solid… thanks so much! Your quilt is amazing! I love love love this! It looks amazing. Do you find sheets work well and hold up as backs? I just finished a version of your raw edge circle quilt and am on the hunt for backing fabric. Also, do you do all your own quilting or do you take it somewhere? I love the aqua & avocado colors! Okay, that is so beautiful. You give me such quilting inspiration. I just finished my 3rd quilt last night. I am determined to do some fun blocks for my next quilt, as I have maintained simplicity with simple squares until now. i always love seeing your quilts! So beautiful. It would be my favorite too. Great idea with the sheet for the backing. Gorgeous!!! I love using sheets for quilt backs. in fact, sometimes I just sandwich two sheets together to make a blanket (we need lots, and have few) when I don't have time to piece a quilt. I heart it too …. Those are my favorite colors! And it's just beautiful…great job! The quilt is beautiful and LOVE the color combo. Great job! It's beautiful! Such pretty colors. It is a beautiful quilt to love! So beautiful!! I love the colors! It's gorgeous – i can see why you love it. Great tip on the sheets – i will have to scope out my Target next time. Lovely! How do you deal with the hems and the top portion of the sheet? Does that get cut off ? Absolutely stunning quilt! 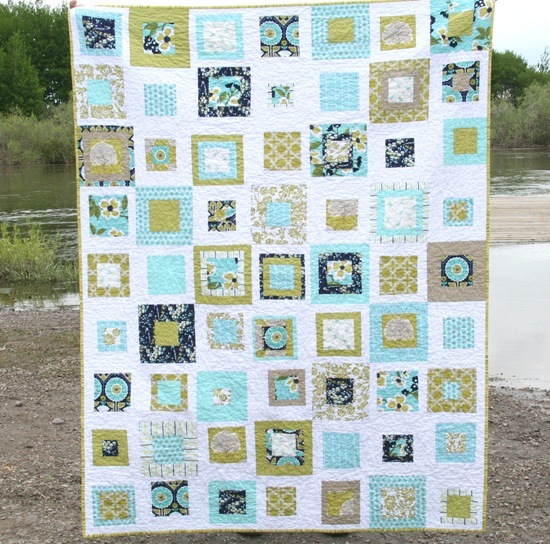 I've always loved the Modern Meadow collection and your quilt's possibly my favourite I've seen made with it :) I actually used the aqua Target sheet on the back of my last quilt… love the colour! This is my favorite! Awesome job. I love those colours together – I would never have thought to put the yellowy green colour with the aqua but it looks amazing! It's just beautiful! I love the colors. Isn't it fun to have a new favorite quilt? I just finished one too. It is beautiful! Great job! awesome quilt Allison, I love it and thanks for the backing tip! there is a Target store 8 minutes from my home. I love using targets individually sold flat sheets for quilt backings too. Its a great way to have a soft comfortable…yet inexpensive… quilt back. I'm in love with this quilt, so beautiful!!!! I do know what you mean by "wish you could see it in person" … I think about that everytime I post a quilt picture in my flickr account!! I loved it when you showed the top, and I love it now! I really want to get that fabric for my month in a bee, but it's not until February, and I'm afraid I'll find another line I have to have before then–I'm sure you know how that goes! I'd love to know how big your blocks are. Love your quilt. This is a fabulous line of fabric and what a great way to display it. And love it for all time! GORGEOUS! I love this fabric line, and I love how you've mixed it with solids. I just wanted you to know I love the blog and nominated you for a blog award on my blog. That is so beautiful! It is definitely worthy of "favorite" status. I love the colors you chose. It's a beauty! Good job! I lurve it!!! I bought the same aqua sheet at target. I gravitate toward that color, so I figured it would definately get used! It's just gorgeous…I love these fabrics and still haven't decided on a project for mine…but yours is perfect for them! Wow, this is a really pretty quilt. It looks like you would feel so peaceful if you were snuggled under it. This quilt is absolutely beautiful! Great job! It turned out awesome! And thanks for the great tip on the Target sheets – I'm going to have to check that out! Duh – guess I should have ready closer – Target, not Ikea. Even better! Fabulous quilt! And so happy you are keeping it to enjoy. Soooo pretty!! I love your colors! I'm glad to see someone else using sheets! I feel validated! My grandma always used sheets as the backing because they just feel snuggly!! I have done the same. You've given me the "ok!" to continue with my "dirty little secret!!" This is STUNNING!!! Love everything about it. I am busy trying to sew my first quilt, and it's actually harder than I thought it would be, lining up all those blocks. I really need to work harder at sewing straight even seams. Oh well, I am learning as I go along. Wish we had Target here in South Africa! LOVE it! You did a fantastic job. That is a BEAUTIFUL quilt! Love the photos, you have a great eye. 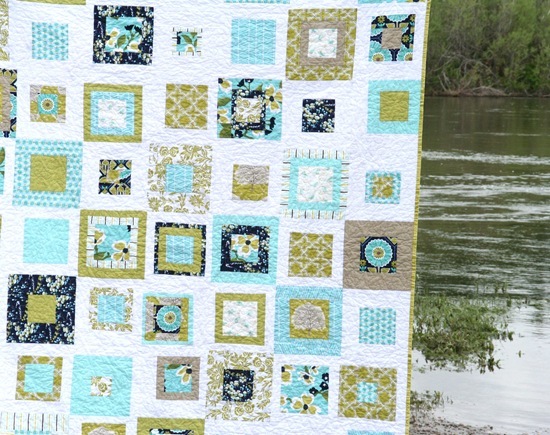 I love the colors of your quilt…I'm so in love with aqua right now. I'll have to try a sheet for backing someday. gorgeous, it's a favorite collection of mine too. Thanks for the tip for the backing, very clever! beautiful! you did a great job. the colors are just perfect! The setting for the photography really compliments the quilt. It makes me think cool-and-comfortable even on a 90 degree day. You have just determined my next fabric purchase, thank you! What a beautiful quilt! LOVE IT!!! Thanks for keeping it real and sharing the Target tip! The price of backing fabric is killing me lately. You're showing us how taking a chance can have huge payoffs. Well done! It really is just fabulous!! I love to back quilts with sheets too. Especially big ones. Love all the aqua. Beautiful. Just beautiful. I absolutely love this quilt! For starters, how can you ever go wrong with Modern Meadow. Is this pattern something that you created? If it is, would you ever consider creating a tutorial or pattern? I love the way it showcases the collection and think it could be just what I was looking for for my Hope Valley. Beautiful! This would never leave my living room…. or never enter… I may be too afraid someone would spill on it. You are amazing.Love your quilt and you sure can do that quick. i really really really really really LOVE it! wow… just… wow!!! I love the pic of it folded on the chair. It looks so homey and soft, comfy! Pretty! What green solid did you use? I've laid the fabric next my Kona color chart and can't find one that looks good! Still one of my all time favorites and I keep coming back to it :) I recently aquired a fat quarter pack of FMF and I think a quilt like this would do it justice. Just wondering if this is the same as the skipping squares pattern?